Prada knit cardigan in virgin wool. Crew neckline; button front. Three-quarter sleeves. Cropped hem. Made in Italy. Dolce & Gabbana sweater in argyle-jacquard wool knit. V neckline. Long sleeves. Semi-fitted. Logo detail at hip. Ribbed hem and cuffs. Pullover style. Made in Italy. 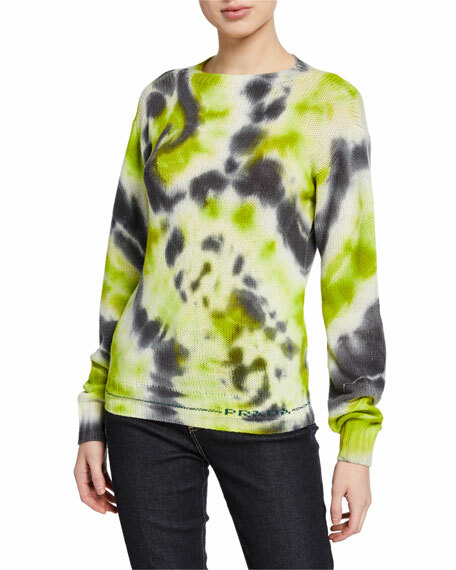 Prada sweater in tie-dyed cashmere knit. Crew neckline. Long sleeves. Semi-fitted. Straight hem. Pullover style. Cashmere/virgin wool. Made in Italy. Prada sweater in whale intarsia jacquard wool-cashmere knit. Crew neckline. Long sleeves. Semi-fitted. Pullover style. Virgin wool/cashmere. Made in Italy.